Yesterday, I did an article on whether or not A Pius Man fell under Pulp novels. I think the answer is a strong "Maybe!" Let's look at the definition for Superversive and see if I can do better this time. Now, this one comes from qualities mentioned by Corey in his post on Superversive SF. We cobbled it together from a podcast we all did a while back where we compiles the list. Aspiring/Inspiring- These mean that the characters aspire to something greater than themselves, and inspire others to seek greatness, and not remain where they are. This also refers to characters who theoretically aspire for uplifting things that aren’t necessarily a part of the moral sphere, such as beauty. “Betterment” and “wonder” both fall here. Oooh, so many choices with this one. I wonder if I should even go into it. Granted, this isn't as big or as epic as they're shooting for. Most of my characters are just trying to live their lives, do their jobs, and go home. Sure, they're cops, or even spies, so their "Day to Day" is probably thrilling to us. Scott Murphy, the Mossad spy, doesn't want to be noticeable or noticed. But there is one thing that they all want in this particular case. There is one, overriding and overpowering desire that all of my heroes are interesting in: the truth. You could say that the truth in this case will also lead to justice, so that's two virtues, but the lines blur here. You could also say that, as the writer, my goals are truth and justice. 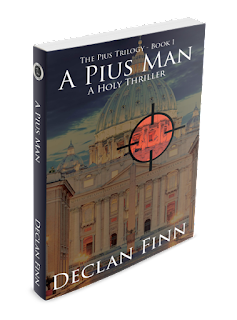 As I've mentioned, the plot revolves around the history of Pope Pius XII and his actions during World War II. Those who have already read Vox Day's The Irrational Atheist already know this answer. So, if Truth and Justice are something to aspire to, check. Virtuous- This means that there is a right and wrong in the world. This does not mean there can’t be moral complexity and ambiguity – in fact, when done well this can be incredibly powerful – but even then there needs to be an understanding that there’s a difference between right and wrong. The characters themselves don’t necessarily need to be virtuous, but the concept of virtue must exist in the framework of the story. Considering that I'm tackling the whole "Hitler's Pope" discussion? You can be darn certain that there will be a right and a wrong, and moral complexity. There won't be much in the way of ambiguity ... though at certain points along The Pius Trilogy, there are some interrogation methods that are definitely in a moral gray area. Heh heh heh. Heroic- Closely entwined with the second category, the Heroic category means that there is a standard of heroism. While this doesn’t necessarily mean that you’ll have a hero (for a brilliant superversive story that features a protagonist who isn’t a hero, see John C. Wright’s “Pale Realms of Shade”), it means that the protagonist has a code of ethics under which they work, a code of ethics that marks them as something more than a villain. To go back to “Pale Realms of Shade”, the protagonist, Flint, might be a Grade A jerk and even a murderer, but he’s different from the demons he’s fighting against; in fact, he has to be for the story to work, because the temptation to become demonic is central to the story. While having truly villainous villains is something of a lost art nowadays and can certainly help flesh out this category, it is not strictly necessary for an Agnes Trunchbull to exist – but a standard for heroism is an absolute must. If I recall correctly, Agnes Trunchbull is the antagonist of Matilda, by Roald Dahl, so was such a two-dimensional evil, it was nearly jarring. However, to work backwards, yeah, I've got a bad guy. In fact, he's such a bad guy, the reason that The Pius Trilogy is three books is due to the villain having so many backup plans, he just wouldn't stay down. I did everything but drop a house on him. But villainous enough? Well, how about a plan to take down the Catholic church, as many religions as possible, and aiming to be a mass murderer by the time his plan is over? I hope that's evil enough for everyone. As for heroes .... well, I did have someone once compare my team here to the Justice League. Though Avengers is hotter right now. Decisive – This means that the characters are active; their actions matter. They are not bereft of agency, at the whim of fate, or purely reactive to the things going on around them. These characters make decisions that affect the plot, and their decisions have to mean something. Books that ultimately preach the meaninglessness of life and the futility of struggling to change it don’t fit this section. Check. This part is easy. I even make certain to note at several points over the course of the trilogy that none of these folks are locked into the story. They can ditch at any time. Non-Subversive- This is pretty much exactly what it says on the tin. These are works that do not attempt to subvert the paradigms of healthy culture, and don’t mock and criticize needlessly. While many great superversive works contain certain subversive aspects – even Lewis’s Narnia series and Tolkien’s Middle Earth books aren’t free of this, nor should they be – the work as a whole should be predicated on building up society rather than bringing it down. Also easy.... I was expecting more work for this one. Western Civilization is built on the back of Judeo-Christian .... everything. Even the contributions of Greece and Rome were preserved largely by the religious, up to and including Irish monks. A Pius Man basically supports everything built by that history. And if you don't believe me when I say "everything" .... you'd be surprised what I can cram into a book. Huh. That was surprisingly easy. I expected another nightmare like with Pulp. I'll take it. So, I guess if you're into Superversive books, A Pius Man might just be your cup of tea. Just click here, and you can preorder it. Who hates religion in fiction?